The NCAA Basketball Tournament always moves along quickly – it seems like only, well, Wednesday that we were watching the “First Four” games. OK, it was. But before we completely forget about that part of the event, let’s take a quick look back at it. I am still congratulating myself on figuring out how to watch them, since TruTV isn’t available on my cable package without a digital box (one set in the house has it, one doesn’t) – and then I had to find the channel, which isn’t exactly ESPN when it comes to viewership around here. The games were suitably entertaining, and we’re in for quite a good ride in the next two weeks if week one is any indication. But before we forget about those early play-in games completely, let’s take a look back at the whole concept. It would seem I have two strong opinions right now, and they are in complete opposition to each other. The NCAA basketball tournament used to have 64 teams in it. It was nice and neat. Everyone in theory was treated the same, with an equal chance at winning the title if they could earn enough victories. Then when extra small colleges got into the act and formed conferences in an attempt to join the party, the NCAA realized that it wasn’t coming too close to having the 64 best teams in the country. So it set up a couple of play-in games for the bottom-feeders. They were told to pack up for Dayton, Ohio, on very short notice to play for the chance to get to one of the eight “first-round” tournament sites. Their reward for winning that first game was the opportunity to go up against a No. 1 seed with very little rest and a little jet lag. Then came along this year. I still didn’t have much interest in the games between No. 16 seeds. But 2018 had a very interesting package of at-large teams in the mix, at least for me. 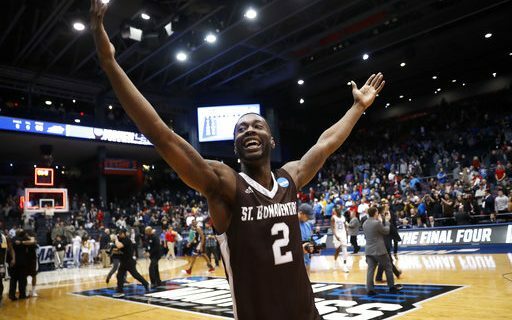 St. Bonaventure is, naturally, a local team – so everyone around here is happy that they get to take part in March Madness. Good for them. The Bonnies looked very good in the two times I saw them in person. It’s a veteran team that is good and entertaining. Their fan base is rabid and devoted. They deserved to be in the tournament, and deserved to be a slightly higher seed. As for Syracuse, well, um, as a graduate, I’m not expected to be particularly neutral about their inclusion. The Orange were lucky to get in, but personally I’m in no position to complain. Note: If you check out Twitter feeds, a portion of the nation’s sportswriters who went to Syracuse – sometimes it feels like half of them – feel the same way. Then there are the two opponents. Arizona State had Bob Hurley as its coach, and he might be more responsible for UB’s rise to respectability in the past few years than anyone. He brought along to Arizona State Shannon Evans, a top-flight player who would have looked good in a Buffalo uniform for four years. Such divorces are always a little messy, but it was fun to see how they were doing. Then there’s UCLA, which hasn’t keep up with its old standards – and who could? – but is still one of the legendary names in college basketball. Besides, I might have been the biggest fan of the Bruins in my junior high school in Elmira, New York, growing up. Those two games were compelling and dramatic. The fans of Dayton filled the building, giving them a big-time atmosphere. And, from a standpoint of upstate New York, the correct teams won. The format probably needs work, even if I’m not sure how best to do it. Could we have four play-in games for No. 16 seeds, and leave the at-large teams alone? Should we just pick the best at-large teams to get to 64, like we used to do? I don’t know. But I do know that this is not the year for me to argue about how the season has worked out. Please take this column, then, and save it for a year. Then change the names, and touch up the arguments. We’ll all be a bit more detached about the subject when it’s Washington and Missouri playing in Dayton.